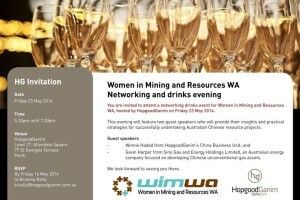 This evening will feature two guest speakers who will provide their insights and practical strategies for successfully undertaking Australian Chinese resource projects. Gavin Harper from Sino Gas and Energy Holdings Limited, an Australian energy company focused on developing Chinese unconventional gas assets. HopgoodGanim. Level 27, Allendale Square, 77 St Georges Terrace, Perth.